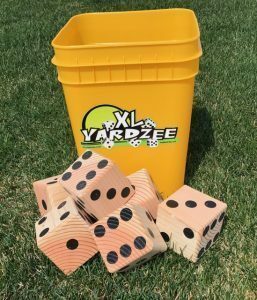 XL Yard Games Products – MrKonchar, L.L.C. For questions or to order, please use our contact page. MADE IN Cedar Rapids, IA, USA. All images and printing is provided by Digital Printing. 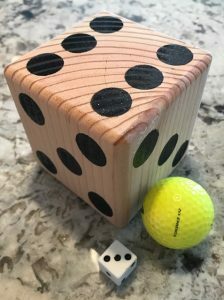 YARDZEE & Yardkle with hand made giant solid wood dice measuring 3.5 inches square. It includes 6 dice, NEW 4 gallon bucket with Lid, and logo. YARDZEE allows you to take your favorite indoor dice games and play them outside on a LARGER SCALE! If you are picking up locally arrangements will be made to do so in NE Cedar Rapids or Hiawatha, IA. FREE Score Sheets at www.xlyardgames.com Thank you for shopping! FOR LOCAL (Cedar Rapids / Hiawatha / Marion, IA Area) PICK UP, please contact us to see if we have any available stock locally. Orders ship within 1-3 Business days when payment is cleared. REFUND POLICY: All requests for refunds are on a case by case basis and are not guaranteed. Our most popular and Large Tumblers, includes 54 solid pine wood game pieces that provides 18 vertical rows of tumbling tower fun and excitement. This set can be enjoyed at any outdoor or indoor party and is awesome for any group event. Each wooden block measures 1.5 inches x 3.5 inches x 10.5 inches (pieces are sanded and cut, may need de-burring, see picture above), comes with carry tote and the Tower Size is 10.5 inches x 10.5 inches x 27 inches. 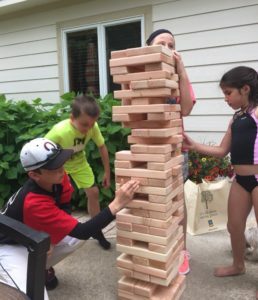 Plays up to 5ft or so before tumbling. Great fun! 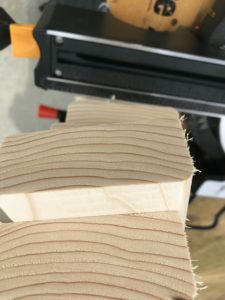 Made from wood, so scratches, dents, defects in the wood (knots, dented corners, etc.) are only cosmetic do not affect game play.